Before you start your walk CHECK THE WEATHER! This cannot be emphasised enough. Knowing and being prepared for the weather conditions will add to your enjoyment of your day, and will keep you safe. Links are provided here to the Met Office forecasts, and weatherline for the Lake District. Weather on the mountains is very unpredictable. It is very possible that you will choose a lovely clear day for your climb, and will start the day in a tee shirt with the sun beating down on your back. As you start to climb higher you may find that cloud begins to form, and the summit will be hidden from view! You will probably be safe if you keep to the well trodden paths (unless visibility is very poor), but we advise you not to go too far from the track. The cloud and mist can form very quickly and become very thick. You may need to make the decision to turn back. It will certainly be much colder at the top than at the bottom - particularly in low cloud. This can be very wet, and if you do not have a waterproof with you, your clothes will get sodden. The links to the right take you to the bottom of the page to see some examples of weather conditions. The Met Office Mountain Weather forecasts are an essential tool for any person walking on the mountains of the UK. You can select the area in which you are going to walk, and the forecast will show the risk level of any weather condition hazards that you will need to be aware off. Each hazard that is likely to occur that day will have a brief explanation. The paragraphs below summarize what you need to be aware of for particular weather conditions, and when the presence of that hazard means you need different equipment, or should not attempt to climb to the summit. 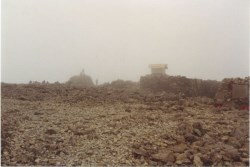 Snow lies on the higher levels for much of the year, particularly on Ben Nevis. If the snow is compacted it will turn to ice which will be very slippery underfoot making the going treacherous. Common sense is needed to assess the ground and whether you should proceed. A little lying snow near the summit may easily be traversed with just walking boots, but snow of any depth, and particularly ice, should only be crossed with proper winter equipment, that is, ice axe and crampons. Deep snow may well cover marker cairns, and make the safe path difficult to follow. Navigation skills with map and compass will be necessary - remember that there is a level of error using a GPS so this should not be relied on in poor visibility or when the path is obscured. If you are near a ledge a navigation error could lead you onto overhanging snow. If blizzard conditions are forecast even experienced walkers should not attempt to climb as there will be near zero visibility and it will be easy to become disorientated. A forecast for heavy snow means up to six inches (15 cm) is expected which could lead to reduced visibility and paths becoming covered and hidden. In cold weather wet snow can increase the risk of hypothermia. When there have been heavy falls of snow, coupled with strong winds, avalanche conditions may occur. The snow is blown onto a surface that it cannot stick to, and walking across this snow may cause it to move and slide down the mountain. This effect is called 'windslab'. 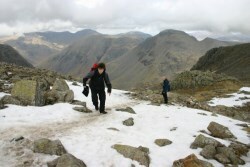 The picture on the right shows windslab on Scafell Pike in the spring of 2013. The windslab has fractured and shows the snow is very unstable. If anyone were to proceed over the snow it would start an avalanche. 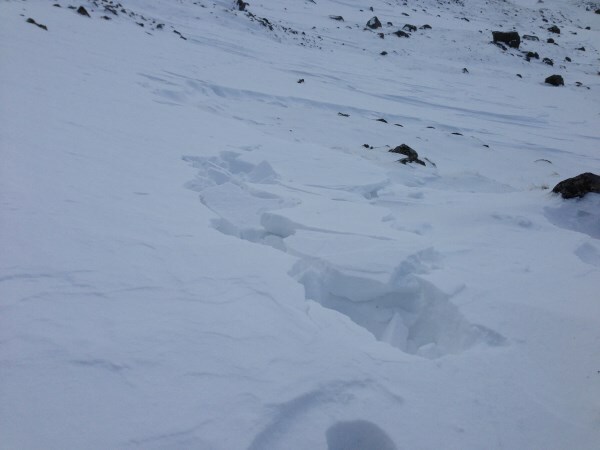 When there is deep snow lying on the mountains do check for avalanche risks before setting out. For Scotland you can find this information at Sports Scotland Avalanche Information Service For Scafell Pike check the website for the Wasdale Mountain Rescue Team as it will have updates on any conditions you need to be aware of, and for Snowdon, the website of the Llanberis Mountain Rescue Team. If you are walking and you come across any snow which appears to have formed windslab - turn back immediately and find another route, or abandon your climb. 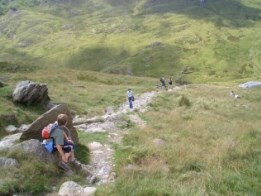 High winds can occur at any time of the year, and the effect will be increased on exposed paths and ridges. Gale force winds (above 50 mph) will make the going very difficult, and storm force winds (above 70 mph) present a real risk of a person being blown over. Avoid walking to the summits when high winds are forecast. Anyone walking at the higher levels can find themselves in thick fog at any time of the year as the clouds move across the mountains. 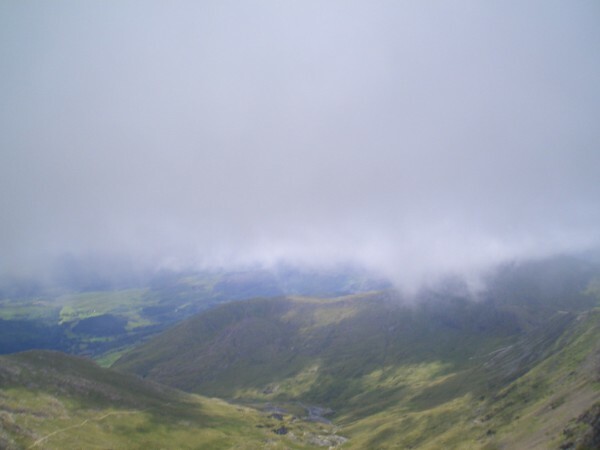 The example weather pictures below show walks which started in bright sunlight, but ended at the summit in very much reduced visibility. Thick fog causes disorientation, and without good navigation skills and a map, compass and/or GPS it might prove difficult to find the right path and descend safely from the mountain. If fog is forecast then it is better to save your walk for a clearer day. 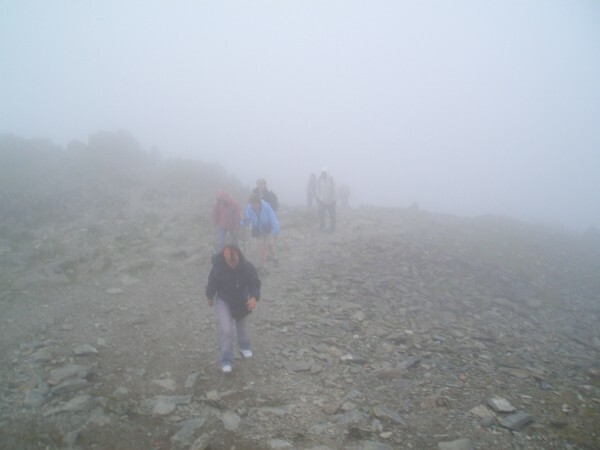 If fog suddenly comes down whilst your walking then make a sensible decision. If you are near the top and the cloud just covers the summit then it's probably safe to continue. If you are lower down and the cloud appears to be thick then turn around and try again another time. A little bit of rain or dampness in mist is quite common when walking on the mountains, and if you are properly equipped with waterproofs then it shouldn't prove too much of a problem. Remember that being wet will increase the wind chill so make sure you are covered head to toe with waterproof jacket, trousers, and gaiters to keep your feet dry. Heavy rain, however, will not only lead to a depressing walk, but will reduce visibility and increase the risk of muddy and boggy terrain. There will be a lot of water running down and over the path. Walkers are advised to think carefully before proceeding when heavy rain is forecast. These photographs on the right are all taken on the same walk on an early August day up the Watkin Path up Mount Snowdon. The day started off without a cloud in the sky - three hours later we were scrambling through thick cloud and near gale force winds, getting very wet. It was great getting to the top, although we could not take the photographs we hoped to get. It was also dangerous standing on the stones at the top as the wind threatened to blow you over the side. The cafe was a real bonus, although very crowded. We had the benefit of really having achieved something - having walked to the top of Snowdon which made up for the lack of views. The poor folks who had come up by train felt they had wasted their money! And just to show mountains have the same typical weather, here's the start of the walk up Ben Nevis with the sun shining. And the summit shrouded in mist! 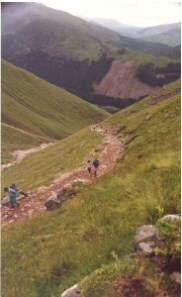 The lesson is be prepared - and especially so on Ben Nevis where you could finding yourself scrabbling through snow! 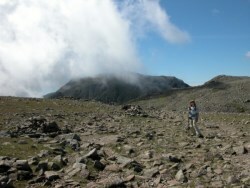 Although we climbed Scafell Pike on a glorious day, one of our party was much faster and decided to go on ahead. He ended up on the summit just as this cloud was overhead - and could see nothing at all! Bad luck - it must have been the only cloud of the day! As on any of these mountains the weather can change quickly, and you have to be prepared. Always remember as part of your preparations to check the weather forecast for that day, and remember to pack your map and compass, waterproofs and warm clothing! The summits of the mountains are many degrees cooler than the temperature at sea level. Although T-shirts and shorts might seem appropriate when you start your walk you will become quite cold as you reach the top. Some weather conditions increase the chill effect and if you are not carrying/wearing the correct clothing there is a real risk of hypothermia. Strong winds, driving rain or sleet, mist or snow can increase the chill factor. You should always carry a jumper in your back pack, but take extra clothing will you if the forecast is for a severe chill effect. Moderate of high levels of UV can occur at any time of year on the mountains, and in winter snow cover increases the risk with the reflected glare. Your winter walking equipment should therefore include proper sunglasses with UV protection. High factor suncream should be carried in your back pack all year round. Sunburn is a risk at any time of the year, even when the weather is cold. If thunderstorms are forecast do consider the risk of lightning strikes on exposed ridges and summits.